Eyewashes: Is It “1 Second” or “1 Motion”? The ANSI Z358.1 Standard (American National Standard) mandates that proper eyewash activation – which describes a unit going from “off” to “on”- shall take one second or less. This requirement has held true since the inception of the ANSI Standard in 1981 and throughout all revisions including 1990, 1998, 2004, 2009 and 2014. Despite this, the myth that the eyewash must go from “off” to “on” in one motion continues to be inaccurately shared. 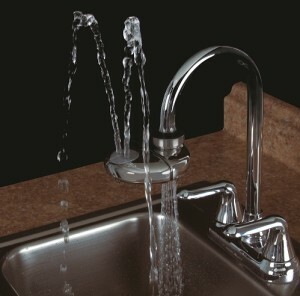 This disconnect in awareness of the activation requirement has come up especially pertaining to faucet-mounted eyewashes where it is required for the user to turn on the water supply and then activate the unit, hence a two motion activation. 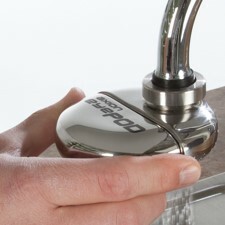 Specifically, the Haws® AXION® eyePOD® faucet-mounted eyewash has proven through testing that it meets the “off to on in one second or less” activation requirement. 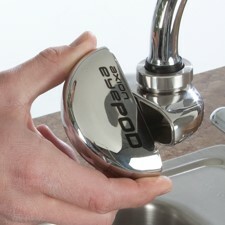 Mounting easily to standard faucets, the AXION eyePOD provides healthcare offices, laboratories, schools, and even households with medically consistent inverted eyewash flushing technology. As seen below, a simple rotation of the unit transforms normal faucet capabilities into a fully-functioning, ANSI compliant eyewash station. Click here to learn more about the AXION eyePOD. If interested in pricing information or receiving a quote, click here. For more information on the ANSI Z358.1 Standard for emergency showers and eyewashes, visit our ANSI Resources page. Need Help Choosing a Thermostatic Mixing Valve? 2 Responses to Eyewashes: Is It “1 Second” or “1 Motion”? Ok, so a well-trained individual who knows how to operate the eyePOD AND can turn on the water supply while suffering an eye contamination can do this in one second, – maybe, – with enough practice. BUT what about the requirement that the supplied water supply be tepid. Clearly victims would not be able to turn the eyePOD and activate the water flow and adjust the water temperature allowing them to hold open the eyes within one second. We can see that happening only if the water is previously adjusted and flowing at the correct temperature. That having been said, do you have an official letter from OSHA specifically stating the Axion eyepod meets ALL of the ANSI requirements and would be accepted by ANY OSHA inspector as an approved emergency eyewash station even if the water supply is hot and cold (not tepid)? Unless we see this letter of acceptance, we hesitate to allow the Axion to be anything more than a convenience eyewash. Thank you for the comment. One of our regional sales directors will be reaching out to you shortly to provide documentation and answer any questions you have.